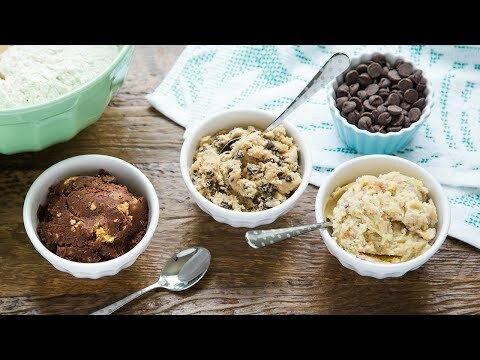 This delicious, small-batch cookie dough has no eggs, preservatives, or artificial flavors. It’s meant to be eaten raw, without fear, by those of us who like cookie dough unbaked. Great on ice cream or as a mix-in for milkshakes, too. This box contains five 3.5 oz. containers. Includes: Chocolate Chip Off The Ol' Block, Birthday Bash, Cookies N' Dream, S'More Please, and Snicker-Dude. Snicker-Dude: Hormone-free butter, cane sugar, heat-treated flour, apple sauce, responsibly sourced palm oil, alcohol-free pure vanilla, organic ground cinnamon, kosher salt. Dimensions (in packaging): 18" x 3.75" x 4"
These were a gift that they loved. I purchased this item as a Christmas gift for my son who loves to eat cookie dough. He absolutely loved Edoughble! It was definitely a hit! Unique gift! Bought these for my grandson’s birthday and he loved them. His faves were the snickerdoodle and chocolate chip. Admit it: there’s a part of you that still wants to eat some cookie dough before you put it in the oven. (Or, eat it all without even using the oven.) Well, Edoughble lets you do just that. 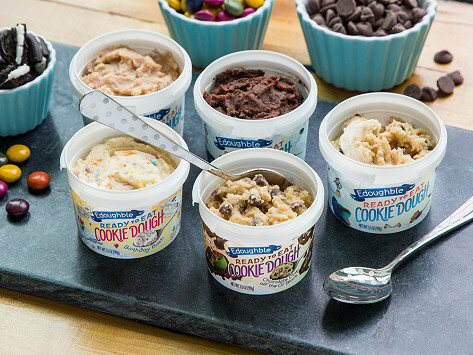 Edoughble is edible raw cookie dough that is meant to be enjoyed as-is rather than baked. There are no preservatives and nothing artificial. Their recipes include applesauce and vanilla paste instead of eggs so the dough is safe to eat straight from the package. Edoughble also goes great on ice cream or as a mix-in for milkshakes. Co-Founders Rana & John Lustyan wanted to create ready-to-eat cookie dough without the riskiness of raw eggs. Since they started the business in 2008, the idea has blossomed into a finger-licking array of flavors. Go ahead: grab a spoon and dig in.